“This is the first time my son ever made progress in his life,” said Rekeia Williams, the mother of an NTA sixth-grader. “I credit it all to the environment of NTA.” She said the school taught him, literally and figuratively, the meaning of integrity. In the late 1990s, when then-Mayor Daley locked in NTA’s $47 million budget, few Near South Side public schools outperformed any city or nationwide average. Today, the Teachers Academy is a Level 1 school, the second-highest rating in CPS’s five-tier system. About four-fifths of its students come from low-income homes. In April, CPS chief education officer Janice Jackson announced a new plan: CPS would expand nearby South Loop Elementary School (SLES)’s attendance boundaries four blocks to the south. The change would leave NTA with only seven zoned students—effectively closing the school. A week later, CPS announced another plan: NTA’s building, once its students were moved, would become a new neighborhood high school. “We don’t have the additional dollars to build a brand new high school every time there is a lack of quality seats in an area,” Jackson said in a later interview. CPS also announced that SLES, ten blocks north of NTA, would receive about $60 million in TIF funds for a new building—over five times more than the $9 million proposed late last year. CPS said the new campus, at 16th and Dearborn—now just three blocks north of NTA—will reduce overcrowding and anticipate a wave of new residents. SLES is currently at least twenty-six percent above its listed capacity, based on various CPS estimates. It’s not yet clear whether the new SLES campus will also incorporate its current building, which is about thirty years old. If it does not, incorporating NTA’s students, as CPS plans, would put the new building at 120 percent capacity. If it does, SLES would remain under capacity, but would have to maintain a large, multi-location campus. The expanded funds and boundary lines were announced under embargo by SLES principal Tara Shelton a week before the public announcement, according to an NTA parent who works in City Hall and spoke off the record, citing concern for their job. NTA staff say they were not notified about the meeting. (Shelton did not respond to a request for comment). That the new boundaries meant a shutdown was disclosed by CPS later—after NTA circulated its own analysis of in-house data. “We had been shut out of the process,” said Watkins. SLES is a Level 1+ school, CPS’s highest rating. It performs well enough to attract students from outside its boundaries, who attend by application. CPS rejected public records requests on the out-of-boundary proportion, but former NTA principal Amy Rome recalls it as a source of overcrowding as early as 2009. Community members from NTA, SLES, and beyond say the plans were drawn up long ago—and are being presented without notice, transparency, or alternatives. They see the closure as motivated less by financial necessity than city politics. And in their fight to keep their school, they believe they’re up against the mayor, their alderman, and CPS top brass. John Jacoby has been advocating for a new South Loop high school for about a decade. 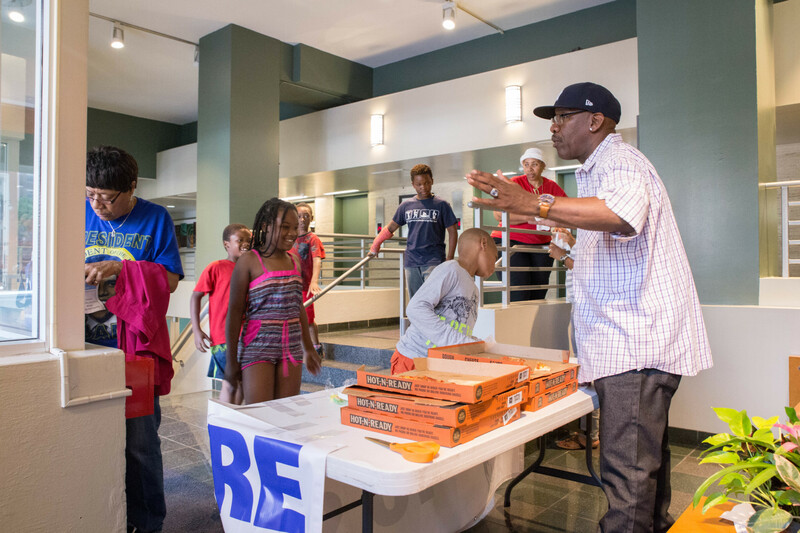 Jacoby, a partner at a Chicago law firm, is vice president of the Prairie District Neighborhood Alliance (PDNA). Jacoby said 3rd Ward alderman Pat Dowell, whose ward covers much of the South Loop below Roosevelt Road and extends some six miles south to parts of Washington Park, has used PDNA, formed in the wake of the South Loop development boom, as a “sounding board” for proposals on development and schooling. Jacoby’s oldest daughter attended SLES until starting eighth grade, and Jacoby served on its local school council until 2010. Jacoby says he has been in meetings with members of the mayor’s office and got in touch with current CPS CEO Forrest Claypool as well, bringing his argument for the need for a South Loop high school to their attention. 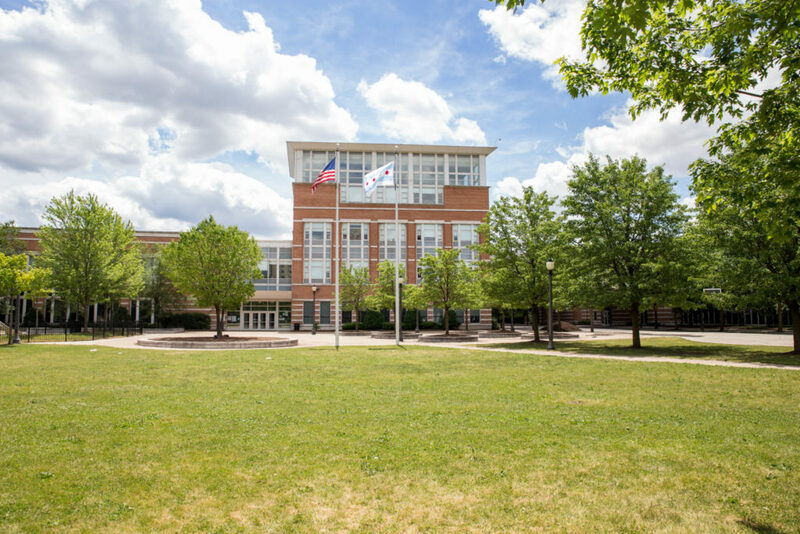 The neighborhood high school for much of the Near South Side is Bronzeville’s Wendell Phillips, a Level 2 school where ninety-seven percent of students are from low-income households. Every student in Phillips’s last graduating class was accepted to a college or university, but it posts much lower test scores than selective schools like Jones College Prep, which Jacoby’s older daughter attended. Jacoby later said he did not want to speak for other parents in the South Loop community. Twenty years ago, observers were already making reference to “a decades-long tug-of-war for control of South Loop.” For SLES, that manifested in conflict between new developments and the public Hilliard Houses at State and Cermak. Michael Klonsky, then director of UIC’s Small Schools Workshop, worked with SLES administration in its early years. SLES opened in 1988, after two years of debate between Hilliard residents and affluent newer arrivals. A final compromise saw the school start with seventy percent minority enrollment. Not everyone was satisfied. Hilliard residents, who had sought a new elementary school since the 1960s, felt slighted. And many homeowners in affluent South Loop developments feared SLES would end up “just another mostly poor, mostly Black public school in Chicago”—a student body more like NTA’s. A few years later, with SLES seen as underperforming, CPS rejected a new proposal by those affluent parents: a charter school with a thirty-percent cap on low-income students. Once CPS administration nixed the charter plan, the team behind it shifted to lobbying for a more “viable” public school. Today, the SLES student body is twenty-nine percent low-income. NTA was built on the site of the now-demolished Harold Ickes Homes’ community center. Then-Mayor Daley guaranteed that NTA, with extensive public facilities, would double as a replacement. But as the land picked up value, neighborhood residents remained skeptical that the city had their interests in mind. NTA’s facilities were attractive, and some at SLES raised the idea of moving their middle school to the NTA building. CPS was amenable. Amy Rome, then NTA’s principal, said she first heard of the proposal when a reporter called for her take. SLES had hashed it out with CPS alone. The plan entailed keeping the student bodies apart: a separate NTA entrance, staggered school hours—“so they wouldn’t need to be out in any common space with our kids,” Rome said—a separate cafeteria, and a separate main office. NTA saw it as a slap in the face. After public hearings—with Dowell on NTA’s side—and mounting protests, CPS relented. District higher-ups apologized. They promised Rome that if CPS had another plan involving NTA’s building, they would seek NTA input from day one. Without out-of-boundary students, and after the full move of the gifted center, NTA parents think each school would operate near ideal capacity. Rome and current NTA staff both estimate that, beyond the gifted program, NTA could absorb at least fifty SLES kids. The offer hasn’t gained traction. As for the change in Dowell’s support? Will Barroso is an SLES dad. He’ll join its local school council next month. He doesn’t think the building plan adds up. According to CPS’s website, NTA currently has a population of 685 students, and SLES has 765. The $60 million grant came a week after some South Loop parents reportedly met behind closed doors with Emanuel. City Hall claimed “unforeseen technical issues” have kept it from fulfilling a public records request for relevant records. John Jacoby said Dowell “has made it clear” her priorities are SLES overcrowding and a new high school. What’s in it for Emanuel? The NTA parent in City Hall said they believe the mayor needs Dowell’s endorsement for his 2019 reelection. Emanuel, whose popularity has tanked among Black voters, has to earn support from officials in majority-Black wards to keep his hopes alive. Both the new elementary and high school are slated to open months after the mayoral election. But starting with a May hearing on the boundaries—held before the high school plan went public—Dowell was clearly startled by NTA opposition. Parents packed the house. That someone was NTA parent Corey Harris, who protested from the audience. He said Dowell’s staff reached out to him after the meeting—to offer his daughter a spot in the gifted program at SLES. Harris believes Dowell was trying to buy him off. Alderman Dowell, through a spokesman, called the allegation “absolutely untrue.” Harris, the alderman said, was upset that his daughter hadn’t won a spot in the gifted program, and although Dowell’s staff gave him a card to follow up, they say he never did. “That’s not an honest explanation,” Harris said. He said he rejected the offer, and that Dowell told him, if he changed his mind, that her staff could get his daughter in. Either way, NTA opposition and mixed publicity have put the alderman in a tough spot. Barroso wonders whether, to “gain some support from another part of the neighborhood, she’s willing to sacrifice her support” from NTA. Williams said Dowell’s behavior at the meeting was what convinced her the deal was done. CPS’s town halls are supervised by network chief Herald “Chip” Johnson. At the first hearing, on June 6, Johnson presented his role as nonpartisan. Six days later, Johnson arranged a closed gathering of Near South Side elementary principals. According to one participant, who spoke on the condition of anonymity, Johnson asked the principals to recruit “individuals that could be vocal” for the next town hall. Johnson handed out talking points in support of CPS’s plan, and encouraged principals to talk to parents about attending. Alternative proposals “came up,” that participant said, but only at the suggestion of another principal. Using NTA, they said, “was presented as the preferred option.” CPS did not respond to requests for comment by press time. Will Barroso thinks SLES parents would consider other plans. Facing opposition, CPS has made a new case: repurposing NTA will yield enough savings to build a new high school in Englewood, on the South Side. The high school would cost less than the SLES development. “If they put some of that sixty million [for SLES]” into other neighborhood schools, Rekeia Williams thinks many more students would benefit. “They are shutting us out of the process,” she said. TIF “generates $500 million a year for this city,” Jacoby said, pointing out that City Hall has funded a range of projects based mainly on political pull. “If they’re ready to pull the trigger, advocacy won’t make a difference,” Jacoby said. But both recalled the force of community organizing against recent school closures—including the viral activism of Garvey Elementary student Asean Johnson. Klonsky and others referenced the hunger strike that led to the district’s reopening of the South Side’s Dyett High—very much, Klonsky said, against CPS’s wishes. Two more hearings are planned. NTA parents have been advocating alternatives—building a new high school building, or using funds to develop existing schools like Phillips and Bronzeville’s Dunbar. If they can push CPS to consider other options, they may be able to hold onto their school. Whether or not NTA survives, it sits on a fault line. Rising South Loop land values and scarce city resources have driven more than three decades of racial and economic tension. Rising costs in the neighborhood play a part in a Chicago-wide, decades-long exodus of Black families. There’s a precedent for City Hall pushing through unpopular plans. But the history of community resistance is just as old—especially on the South Side. With powerful opposition, NTA will need its own leverage, and direct action, to keep other options on the table. Even an advocate of the closure agrees. Great journalism. You hit so many issues — historical, political, financial, racial — that get at the heart of why NTA parents are so angry with CPS. Thank you for your measured and analytical reporting. I don’t understand why sloop is getting a new school for 60m when there is a clear need for a south side high school for many neighborhoods including bridgeport (and armour sq. ), chinatown and sloop. Why not use that money for construction of a high school instead? One convenient to all these neighborhoods? Why does the sloop get priority over everyone else? Furthermore, nta families should not suffer the loss of their school to benefit anyone else. My daughters attend Disney, but I support the parents and people advocating for NTA to remain the same. When is the next meeting or rally? I am continuously dismayed at the misrepresentation of the neighborhood in the south loop during the discussions that resulted in the SLES. To constantly refer to the ‘new’ residents of the south loop as ‘affluent’ can be characterized from misleading to a complete fabrication (or if it feels better, alternate truth). I was one of those residents. I bought a condo in Dearborn Park in 1981. I did not buy in Dearborn Park because I had so much money that Lincoln Park was just not good enough I bought because it was affordable. At that time interest rates for mortgages hovered in the 14-16% range. Dearborn Park loans were being offered through a partnership with First National Bank at 10%. Do the math. South Loop was affordable at the time. Many of my neighbors bought there for the same reason. We also felt a little like pioneers that were willing to take the risk of moving into a newly developed area. At the time Dearborn Station was a crumbling facade full of rats, Pacific Garden Mission was on the next block so the area was full of people down on their luck. First district police HQ was on 11th Street and every Saturday and Sunday morning the streets were full of individuals being released from the drunk tanks the morning after. On warm summer nights we often had our calm punctuated by loud screaming from lock up. People addicted to drugs that were coming down from a previous high. This is the ‘affluent’ south loop that you refer to when the negotiations for an elementary school were being held. Residents who wanted to stay the area and raise their families among these conditions worked to get a neighborhood school. During some of the meetings, the issue was not that SL (south loop) residents did not want low income students using SLES, it was the proposal that after all the work by the SL residents CPS wanted to bus 1st and 2nd graders from the SL to and elementary school further away. As a resident our position was to open the school only to the grades it could accommodate at the time without overcrowding and not busing the youngest students while also including the youngest student from Hillard. SL does not currently reflect the demographics of the 1980’s and the needs have changed. The city has permitted way to may apartments and it is overflowing with people who are not invested in the area. Your characterization of the neighborhood and the school situation as it began is under researched. Thank you Diana M for your Truth, telling it like it was and is! Seems the heart of this issue is found in the last sentence of this paragraph …. This is a national tragedy in education; parents ought be demanding that schools be structured with fullest diversity of students and teachers. Doing so would be consistent with the latest data that shows these are the best schools for the education of children, and particularly for the progression of this nation. With under enrollment at Phillips and Wells… its not rocket science to fill them with the students that would attend the high school proposed on the site of NTA. For this level of thinking and spending to be forged by cultural and societal ignorance fueled by presumptive entitlement, is a disaster to the future of all children, and to those of us who seek to live in a beloved community. I attended a CPS ages ago, and no longer live in the area. I am fully involved in school district where folk think like that first paragraph expresses, and have generations of children in the process, including their own. …and have *harmed generations of children in the process, including their own.